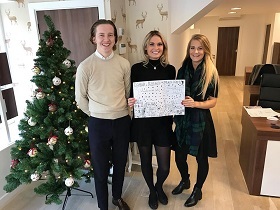 When we opened our 2nd office in Bow, we made a conscious decision to do as much we could to support and get involved with the local community. We immediately joined the East End Trades Guild which supports independent local businesses and were delighted to take part and assist in the first East End Independents Day which took place on Saturday 3rd December. The Guild put on a guided tour of the area which included a stop off at our office. Children from Olga, our local Primary School, had provided us with drawings, depicting what Roman Road means to them, with the attendees of the tour voting for their top three. We donated book token prizes for the top three which we understand were presented at school assembly. Below is a picture of some of the staff and the top drawing voted for! On the same day we also supported the Roman Road Christmas Fair which was held at the Yard Market opposite our office and was a huge success. We donated money which was used to purchase gifts that, were handed out by Father Christmas to local children on the day. My wife and children were here supporting the day, so I made sure they popped across the road and they were duly treated to some handmade gifts from Father Christmas and a bit of banter from the Santa's Elf helper, who looked a little scary from where I was sitting, but enough of my phobias (I don't like clowns either) the kids loved it! Lastly and probably the best part of the day for me personally was having Olga Primary School choir perform outside our office. 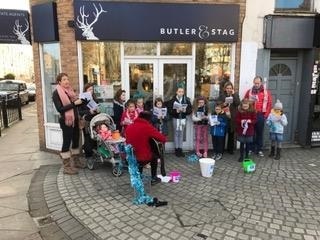 A special mention must go to Olga Primary's music teacher, Karen Swift, who gave up her Saturday to accompany the choir and sat there in the cold singing carol songs for a good hour, before taking her team across the road to join the Roman Road Christmas Fair for more of the same. We put on a few refreshments which the children enjoyed whilst warming up in the office and it was lovely to see such polite, well mannered, children, who were genuinely pleased about our support and so excited to be involved in the day. The generous Bow public dipped into their pockets to raise money for the School which was also great to see. 2016 was a great year for us and it was lovely to finish it off with some local events that bring the community together and that we were able to play a small part in. Safe to say, we will be supporting Olga Primary in 2017 and look forward to more events in the future. Happy 2017 all, let's hope it's a good one!